Build a miniature chest that is sure to become an heirloom. 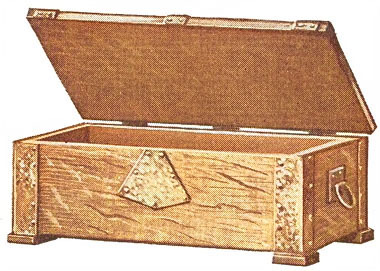 Click here for detailed miniature chest plans. Boys in a manual-training class became very enthusiastic over the making of small chest-like boxes, bound with ornamental metal, and adapted them to a great variety of uses. The boxes were designed to suit the taste of the maker and for use as glove, handkerchief, jewelry, toilet, treasure and other boxes, lined with silk, and finished in wax and varnish, in various stains. Oak was used for most of them, and the metals employed were largely copper and brass, although silver is suitable for small boxes. They are simple in construction, as shown in the working drawings, and can be made in the home workshop. The photograph reproduced shows a group of boxes, for various purposes, and in several styles of metal binding. The long box at the top is for gloves or ties; the larger ones are for the boys' personal use, caring for collars, handkerchiefs, etc. ; the smaller boxes are for the dresser, providing for the care of jewelry and similar small articles. The boxes proved great favorites as gifts, and the monogram of the recipient may be etched into the metal. Well-seasoned oak is the most suitable material for the making of the boxes, as it harmonizes well with the plain metal trimmings. The quarter-sawed variety is preferable, being more ornamental, and less likely to warp or twist. For most of the boxes, stock 3/8 in. thick is suitable, although this may be cut down to 5/16 in. for the smaller boxes, if convenient. The method of joining the pieces is similar in all the varieties of boxes, and the jewel box illustrated in the working drawings will be taken as a specimen. The sides of the box are butted against the ends, lapping over them, flush, and nailed with small brads. The bottom is fitted between the sides and ends, and nailed so that the nails are concealed by the metal bands, at the four corners, and at other points, if bands are placed near the middle. The stock for the box is cut and finished on all sides to the following dimensions: all pieces to be 3/8 in. thick; top, 4½ by 7 1/2 in. ; two sides, 1 7/8 by 7 in. ; two ends, 1 7/8 by 4 in. ; bottom, 3¼ by 6¼ inches. All the pieces should be scraped carefully to a smooth finish, and the nails started with an awl, or a slightly flattened nail of the same size, fitted into a hand drill. Extreme care must be taken, in nailing, that the surface of the wood is not marred, which is likely to occur if the nails are driven into the wood too rapidly, or without starting holes for them. The feet are cut from a strip, 3/8 in. thick and ¾ in. wide, the cut edges being sandpapered smooth without destroying the squareness and the sharp corners. They are nailed to the bottom of the box with brads, care being taken to have the end grain of each block at the end of the box, particularly if the metal trimmings do not cover the blocks. The cover is fixed in place with small plain butts, countersunk into the wood, one leaf into the top and the other into the back of the box. A simpler method is to set both leaves of the hinge into the edge of the back. Care must be taken in fitting the hinges that they are set in line with the back of the box, and holes for the screws should be made before driving them into place. Too much care cannot be taken with the fitting of the hinges, as the proper fitting of the lid, both as to resting level and being in line with the edges of the box, depends on the fitting of the hinges. After the construction work and nailing is completed, the box may be sandpapered carefully, rubbing in the direction of the grain, and being careful not to round off the edges unduly. The over sandpapering of woodwork marks the work of the careless novice. The box should be handled as little as possible while the metal trimmings are being fitted, and, before the finish is applied, should be gone over lightly with sandpaper to remove dirt. When the metal pieces are fitted, and ready to be fastened in place, the finish may be applied to the box. Warm browns, or other dark-oak finishes, are best suited to the simple style of chest, and the metal fittings. A coat of stain should be applied, and this followed, when dry, by a coat of filler, rubbed well into the pores of the wood. The filler should be permitted to dry hard, and the surface is then sandpapered very lightly with a fine grade of paper — No. 00 is best. Do not rub through the filler or stain, particularly at the corners. Wax is the most readily applied outer finish. Several coats may be used to give a substantial finish. A coat of shellac, followed by coats of rubbing varnish, dried well and rubbed between coats with No. 00 sandpaper, may be applied for a high-gloss finish. This is a more involved process and requires that the varnish be rubbed down with pumice stone and water, and finished with an oil polish. Copper or brass, of No. 20 gauge or lighter, is suitable for the making of the trimmings. The details of the handles are shown in the sketch, at the right. Cut a back plate, 7/8 in. by 1¼ in., and fit the handle of wire to it by means of a strap, bent from a strip of metal, 3/8 in. by 7/8 in. The other bands are merely strips, ½ to ¾ in. in width, and fitted to the size of the box, where applied. Strap hinges of the same metal may be made, but the most convenient method for the amateur is to fit the metal strips into place at the hinges, merely as ornamental features. Various types of locks may be fitted into the box, and for the worker having the necessary skill, it is interesting to make a hasp, as indicated in the sketch. The designing and making of the metal trimmings affords unlimited opportunity for originality, and a good plan is to fit the desired strips, cut from paper, to the box before making them of the metal. It is well to remember, in this connection, that the simple bands and forms are better suited to the plain box than ornate trimmings. Having determined upon suitable patterns for the metal strips, cut them from the sheet with snips, or tinner's shears, care being taken to produce a smooth edge. A file may be used to remove roughness and to round the edges of the metal slightly. The metal is fastened with escutcheon pins, which add to the ornamental effect if properly spaced. Holes for them must be drilled, or punched, through the metal. The metal may be left smooth and polished, or hammered with the round end of a ball-peen hammer, to produce the dented effect shown on several of the boxes in the group. This, as well as other finishing of the metal, must be done before it is fixed in place. Beautiful colors may be given to the metal by heating it, and observing the colors as they "run." A trial will enable one to judge the proper heat for the various colors, which "run" from a light straw to a deep purple, with various reddish intermediate tones. A brown oxidized finish, or a verd-antique — greenish finish may also be obtained. The metal should be polished with wax to preserve the finish if other than the latter type is used. The boxes are lined with silk or other suitable material. The method is as follows: Cut cardboard pieces to fit against the inner sides of the bottom, sides, and ends. Pad one side of them with cotton batting, and cover with silk, gluing the edges of it on the back of the cardboard, as shown in the sketch. By bending the pieces slightly, they may be inserted and glued in place. Care must be taken in handling the glue, that the silk is not soiled. Pads of felt, or chamois skin, may be glued to the bottom of the feet of the box, so as not to mar the surface upon which it rests. The most popular boxes, which are especially suitable for gift purposes, are the jewelry, glove, and handkerchief boxes. Their dimensions are: jewelry box, 2¾ by 4 by 7½ in. ; glove box, 3¼ by 5 by 13 in. ; handkerchief box, 4 by 6 by 10 in. Other sizes suited to special purposes may, of course, be designed readily, and made in walnut, mahogany, or other cabinet woods.